Let me start with a quotation from Lori S. about the new, fourth album of ACID KING: “Everything still feels like riding a motorcycle on Quaaludes, but things have expanded". Well, I never have ridden a motorcycle on Quaaludes, but I think that's a pretty good description, not only for the band's new album. As to the second part of her statement, I can also go along with that. Nowhere is this clearer than in the song 'Center of Nowhere', where ACID KING do not only play their typical huge, fuzzy riffs, but also some sort of ambient-like guitarwork. 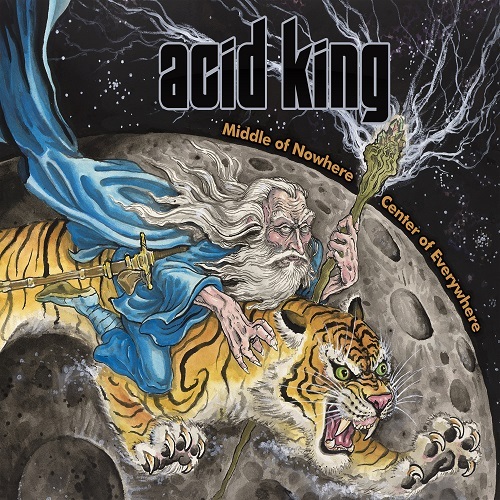 But in general, 'Middle of Nowhere, Center of Everywhere' is convincing with all the typical ACID KING elements: slow, plodding riffage as well as Lori's ethereal and spacey vocals. There are plenty repetitive song structures, but when you listen closely you will discover the band's attention to detail. Lori's riffs are precisely layered on top of the other, while drummer Joey Osbourne is pushing everything forward with his dynamic style. Mark Lamb's heavy-duty bass provides for the cohesion within the band and forms a strong foundation. It is absolutely apparent that ACID KING has created their own sonic world over the last 22 years. With each additional release they perfected their hypnotic sound, and 'Middle of Nowhere, Center of Everywhere' forms no exception to this picture. So, let me finish this review with another quotation from Lori S.: "“We never played this music for popularity. There are no rules. We do everything how we want to. Acid King has always been driven by that". There is nothing to add to this except: what a great album!